Advanced Vision Care now performs all treatments under one roof with our new Alcon Non-Laser Surgical Theatre! We are extremely proud to inform you our new non-laser surgical theatre is up and running. We have already been performing surgeries with the latest technology. But now, AVC are the first clinic in the UK to house the new Centurion Vision System along with the LuxOR LX3 Microscope and the Verion Image Guided System. This design adds greater accuracy and efficiency during the surgical planning, the execution and it makes the whole procedure even more precise than it has ever been. Phacoemulsification (cataract) treatment remains the most powerful, versatile and efficient way to remove all degrees of cataracts. 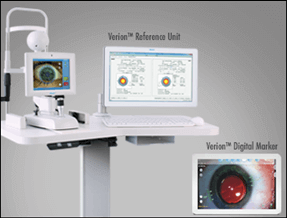 The Centurion Vision System sets a new standard for phacoemulsification. It is an intelligent system where every stage of the removal procedure can be dynamically optimised. This makes the whole process safer for patients and more comfortable for the surgeon. The Centurion Vision System provides a new standard for the stability of the anterior chamber during the surgery using Active Fluidics. This intelligent system can stabilise the anterior chamber to the surgeon’s preferences. The surgeon can set a desired Intra-ocular pressure target and the system then maintains this throughout the surgery. This not only gives the surgeon greater freedom to work to their liking and greater control but is also a safer procedure for the patient. This is the only technology that accounts for these types of variables and results in improved outcomes. The system in addition provides a balanced energy solution, which is achieved by accommodating the surgeon’s preference settings. This again allows for greater surgeon control and therefore more efficiency for the lens/cataract emulsification stage of the surgery. 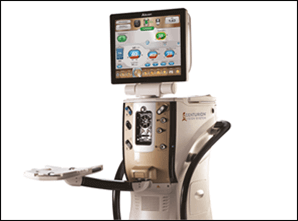 At Advanced Vision Care, we have the Verion Image Guided System combined with the Centurion Vision System. This encompasses the whole journey from taking measurements, planning, guiding and performing the surgery. The Verion Image Guided System consists of 2 devices. The first accurately measures key pre-operative parameters of the eye. It also captures a high resolution diagnostic reference image of your eye. This is so advanced it can automatically detect certain eye features like the pupil, the iris and even blood vessels of the sclera. The surgeon can then use this highly sensitive data to efficiently determine a customised surgical plan for you. Multiple advanced intra-ocular calculation formulas can be performed including the power and lens selection. The surgeon can use this to plan the incision and the implantation position and tailor the procedure to each individual. The second device uses the specific information from the first to provide a guide to the surgeon during the procedure. This is helping to put the plan into action. The surgeon can view the customised plan whilst performing treatment which helps the surgery be even safer and more accurate for the patient. This system automatically registers the patient from the sensitive ocular data it captured whilst imaging. This makes centring and aligning the intra-ocular lens more precise. It accounts for any rotations of the eye automatically. The system also allows documentation of the data to help optimise procedures over time. 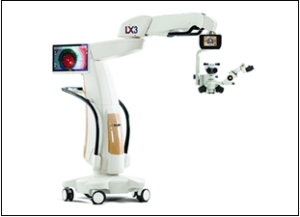 The LuxOR LX3 Microscope provides the surgeon with a 3D view not available with previous microscopes. This enhanced view aids the surgeon to provide exceptional depth perception as well as a crystal clear view to perform this intricate surgery. This greater control of settings for the surgeon together with state of the art technology and image capturing means each surgery is tailor-made to each individual patient to provide the most safe, accurate and efficient procedure. If you have cataracts and would like to find out more about our new Alcon Non-Laser Surgical Theatre and how it can completely transform your eyesight, then why not call AVC TODAY on 0800 652 4878 and request your free information pack or book your consultation to find out how we can help you.